Oga Noel. Your review hit in on the head “kpom-kwem” like we used to say in the old days. I managed to read about 70% of the book before it was hijacked by a friend of mine in the US last month. 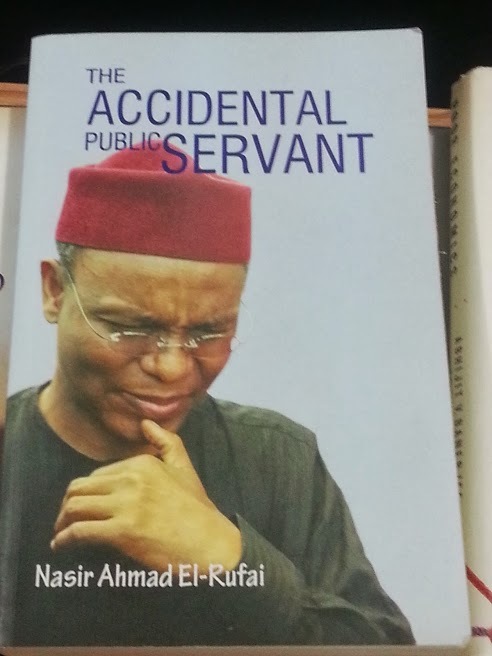 I was going to pick up another copy upon return to Nigeria but have not been eager to do so, simply because I can’t fathom spending another 5K to contribute to El-Rufai’s “vain-gloriousness” (as coined by my father). To me, the book read more like a work of fiction than something that actually happened. Yes he gave us an insight into the rot that is governance in Nigeria but the way he presented it made it even more difficult to believe. No one can attain the status of sainthood when involved and have excelled in that rot, but El-Rufai tries to convince us that he has. And that not only smacks of dishonesty, but also disrespect to the reader. I particularly found his use of direct quotations to relay events that he was in very annoying. Either he recorded these events or he has a photographic memory to remember everything that was said in these meetings and how it was said. This was not only misleading but bordered on intellectually fraud and forgery. Paul nwannem, onwe ndi bu ndi FOUR – and this book qualifies the author to be their life chairperson! It affords one a peek into the mind of a dishonest person who wants to be seen as honest. Sad! Really sad. On the recall issue, I hear El-Rufai claims he made copious written records of all his interactions with people at the end of each day! What a life! Still his memory must be photographic for him to recall verbatim what people said and for him to be able to quote them! A simple game of recall I normally use either as an ice breaker or an energiser in workshops I have run over the years shows me repeatedly that humans do not have the capacity for that type of verbatim recall for things said even within a five minute time frame! But Mr El-Rufai would prefer to hold on to his silly claim rather own up to the fact that in those quotes, he was simply indulging in creating fiction, just as he was in much of his book. I taya for people! Your review is all I have read of this book. Your patriotism shines through every sentence. This should account for the length. There is no surprise in what this book portrays- yet another politician who has little interest in or respect for the people they are supposed to represent. They are there for what personal material gains it avails them. You cannot embark on such a project if you ever thought that many of your people can think for themselves and see through your fraud. You have never depended on them for power and have never sought their well being. Any surprise we are where we are as a country. I am glad someone has taken the time to shine some light on the filth to show what we must all be praying for. IK, Many thanks. Ours is a sad country where “Lie and Fly” appears to be paying off so handsomely – and “clever” people like El-Rufai are exploiting this sad ethos so effectively to climb the political ladder and to remain relevant. We shall overcome, mmeri bu nke anyi!. Thank you for your incisive unmasking of this amoral Lilliput. Thank you, God bless you real good! Thanks for reading and commenting. I appreciate. Thanks for this detailed review. It thoroughly undressed NER to reveal his warts and moles for all to see, and this aligns with other reviews of TAPS that I have read. Still, TAPS is a useful book. It warns us about expecting anything from those who lead us. Like NER they are mostly sly wolves. On a different tangent, I would have loved to see you reflect more on the lost opportunities exposed by TAPS, so Nigerians will know how much it cost us to have the likes of NER in executive positions. Thank for investing time and meticulous effort to keep the rest of us educated, and honest. Thanks, Arinze. Yes, I agree. A para dedicated to pointing out the effects of the lootings and the lost opportunities for Nigeria would have further enriched the review. Thanks for dropping by, reading and commenting.